New courses take players on wild rides over a mountain road, on city streets and through a dusty desert. Nintendo fans will recognize new courses on Wuhu Island and in the jungles from Donkey Kong Country™ Returns. Hell yeah. Just get rid of blue shells please. @Pixelman,Probably not but I agree with you. I hate those stupid blue shells. I want it to be toned down from the Wii version, less items and characters, and back to 8 players not 12. And if they can stop people from cheating during online that would be great too. The graphics looks great. I will buy this. Nobody get between me and a 3DS. It is so on! I love Nintendo! I wish for them to add customization to multiplayer (especially item control). Track Editor and Downloadable Tracks please. UNLOCKABLES, Paratroopa, Baby Luigi, Daisy, Birdo, Donkey Kong J.R., Petey Prihana. Dlc(which should be a new feature) Jungle pack, Diddy Kong, Dixie Kong, Funky Kong, Lanky Kong, Cranky Kong, Tiny Kong and Chunky Kong. Koopa Pack, Bowser J.R, Hammer Bro, Dry Bones, Kamek, Magikoopa and Koopa Kid. Baby Pack, Baby Daisy, Baby Peach, Baby DK, Baby Wario, Baby Yoshi and Baby Bowser.Other dlc Charaters Shy Guy, Toadsworth, Boo, King Boo, King K Rool, Kritter, Goomba, Para Goomba, Wriggler, Monty Mole and Blooper. 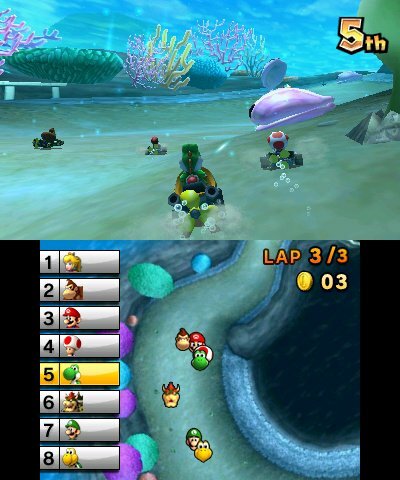 The Game should be transferable with the wii so you can add extra characters and extra tracks. I also want them not to have 12 players go back to 8 definately dont have bikes its mario kart not mario bike and I do hope they dont have characters like Dry Bowser and definately Roselia she's the worst mario character of all time. I'm so excited about this I'm not Getting a Nintendo 3ds until this comes out. I Hope we see a return of Donkey Kong J.R.
@nintendonerd147 It would be funny if they had 16 people in races. I thought bikes were good but you have a point with it being called Mario KART They probably would have to call the game, Mario Racing instead. LOL. That'll never happen. Right this is my actual final character roster Starter Characters: Mario, Luigi, Peach, Yoshi, Toad, DK, Bowser, Wario, Koopa Troopa, Shy Guy. Unlockable Characters: Daisy, Waluigi, Birdo, Boo, Bowser Jr, Diddy Kong. The reason why I haven't put DK Jr in is because I know he isn't gonna be on it because he has not apperaded in a game for 10 years now and there is no point of hoping he will. 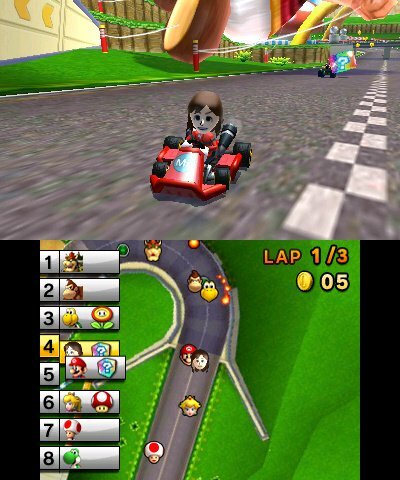 I think you should be able to transfer the characters who aren't on it from the wii version they should also be tranfered using their own colour karts from the 3ds kart shape version not the wii. And there needs to be downloadable characters for 50 3ds points per character Maybe then DK Jr will return then finally. 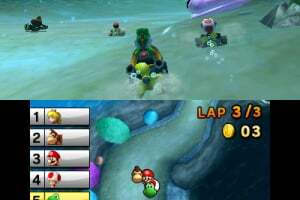 @yellowtails do you want 16 people per race, and do you ever think DK Jr will return, and thanks for agreeing about my point about bikes do you think bikes will apeare on mario kart 3ds? 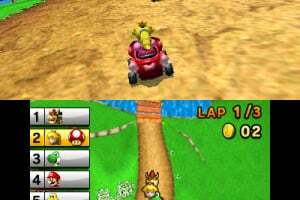 On the Mario Kart's I play as Koppa Troopa and DK Jr on SNES(well vc actually) Mario on n64(vc actually) Gba don't play on it it's that rubbish. Koopa Troopa and Para Troopa on the Gamecube. Yoshi on the DS. 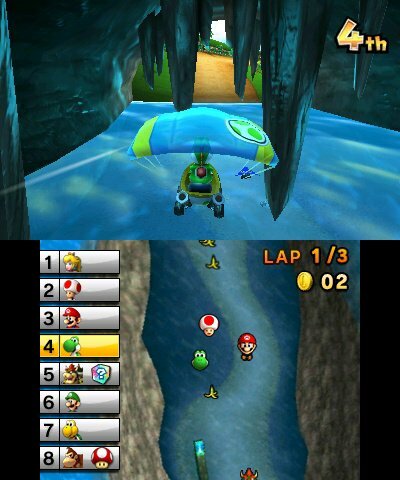 Koopa Troopa on wii. Who will it be on 3ds? @NintenDude97 I was asking a question to tjarvis not you? BTW I wouldn't like to see the Bullet Bill item. If they Put More Characters This will Be An instant Buy! The game itself wont be 3d but the power ups and they're effects (such as invincibility, or a blue shell) will. Also I saw miis in the background witch makes me hope and wonder if there will be a mii channel for the 3ds. looks like mario gets to drive around wuhu island too. cool. imported miis from he wii? or will they be made on the 3DS now? I think the mario kart needs to have tricks to pull off. If it doesn't it will take me a long time to buy this game. Unless of course if one tries to convince me. Edit: If you didn't already know this there is a mii channel. things i would like to see, 8 players on wifi instead of 4 , a bit more characters, l'd like to see some more girl characters maybe like rosalina or toadette so that way girls who play have more characters to pick from. Last mabye a track editor or downloadable tracks from mario kart wii & dirt bikes thats all. Yeah, my wife loves Toadette. We just played some Mario Party the other night. You have to love the weird fungii pigtails! And do not get her started on why Toadette wasn't in Mario Bros. Wii instead of a blue AND yellow random Toad... This would be my number two character added in as a sleeper character; first would be Koopa Troopa. This look amazing! it has such a great feel about it, and it seems to have learned alot from mariokart wii. this is what i love about Nintendo, they develope then shuffle( and they give us new games on older systems) i cant wait to get my hands on this it looks great!!! this has just sold me the 3DS, BTW did anyone notice the Mii's in the screen shots? will 3DS use Mii's? Im a champ at MarioKart games. Im ready for the next Mario Kart game. I think the Miis are there because that course is Wuhu Island from Wii Sports Resort. They might just be pre-set by Nintendo. But that's just my theory, It would be awesome if there was a Mii maker on the 3DS. I only want 2 baby characters: Baby Mario and Baby Luigi. "It would be awesome if there was a Mii maker on the 3DS". 3ds. Wii Miis can be transfered with 3ds Miis as well! 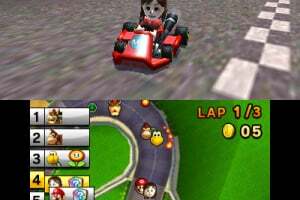 Its just a matter of if nintendo will allow you to unlock your miis like on Mario Kart Wii. There's a good chance they will put that feature in. Downloadable characters and tracks would be awesome! Now I'm going out on a limb here, but what if you could download specially made power ups? 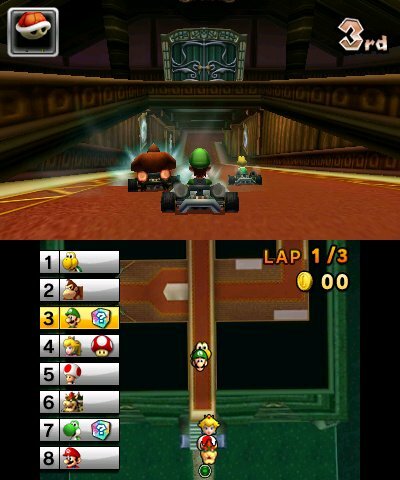 Also will there be special items to each character like in Mario Kart: Double Dash? That would be cool. Starting characters: Mario, Luigi, Bowser, Koopa Troopa, Wario, Waluigi, Peach, Donkey Kong, Yoshi, Baby Mario, Baby Luigi, Toad, Goomba, Daisy, and Boo. Unlockable characters: Mii, Baby Wario, Baby Peach, Baby Daisy, Paratroopa, King Boo, Petey Paranah, Dry Bones, Diddy Kong, Funky Kong, Bowser jr., Birdo, Paragoomba, Hammer bro., Shy Guy, Toadette, Toadsworth, red boo, and R.O.B. 1-3 mushrooms, mega mushroom, golden mushroon, poison mushroom(slows people down when run over), lightening, star man, bullet bill, blue koopa shell (nintendo is going to put it in anyway), brick block (sends people spinning when hit), and pow block. The only thing better than a serious,"illegal" street racer is a humerous, cartoonish racer (nothing against street racers). nintendonerd147 said: do you want 16 people per race, and do you ever think DK Jr will return, and thanks for agreeing about my point about bikes do you think bikes will apeare on mario kart 3ds? @nintendonerd147 It would be crazy too have 16 people so yes, DK Jr will have a slight chance of returning, and maybe bikes might return. You are welcome. Edit: I don't think 16 people per race is a good idea anymore. I think it should be an option of how many people can be in a race at a time. I really want this game! I am totally buying it when it comes out! WHY CAN'T TIME GO FASTER!!! Virtually three months to go to see if all our speculation are true or not. But it feels so good when you hit someone else(!) with a blue shell, right?! How about some wifi updates? Maybe you can have a friend join you and you can both search for a game? How about a little more customization.. more karts and characters? 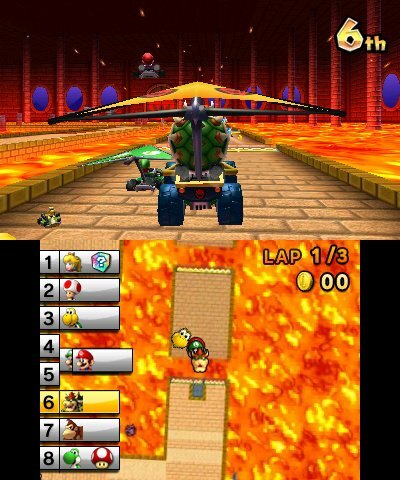 maybe new tracks for the history of Mario Kart? we'll have to wait and see. I have high expectations for this game. What if you could customize your online item list? Different people would use different items they want to use. That would COMPLETELY change online gameplay! @Nintendude97 you broke the Yoshi chain!!! It had 6 yoshi avatars in a row, 3 different ones!!! You broke it!!!! Its looks great and it looks like you can drive through Peach's Castle for once. There are only showing standard Karts though. That worries me. They just dont want to spoil too much. We barely know any thing about it as it is! -It'll have standard karts, at the very least. There's nothing to worry about. More will come as time goes by. 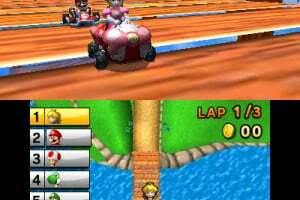 Mario and Luigi the game only have thats cool i thought that mario kart 3ds has all the people from super mario. i think it has all super mario guys iv`e watch an video of all the characters wich are in the game one of them is ROB!!!!!!!!!!!!!!!!!!!!!!!!!!!!!!!!!!!!!!!!!!!!!!!!!!!!!!!!!! @56 they didnt reveal the characters yet, the movie you saw probably was a fake. 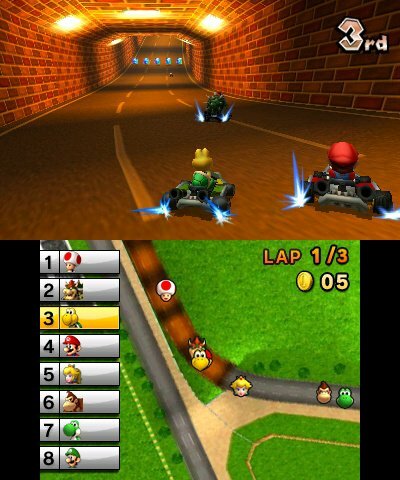 i knew they were going to make a mario kart for 3ds because they make only 1 mario kart game for each nintendo system. I would like on my mario kart 3ds baby mario,baby luigi,baby peach,baby daisy,koopa,drybones,toadette and toad ,.............That was light weight...Middle weight are mario,luigi,peach,daisy,yoshi,birdo,bowser j.r,and diddy kong.......HEAVY WEIGHT!!!! wario,bowser drybowser,rosalina,donkey kong,waluigi,funky kong.and king boo..........................................................LEAVE COMMENTS ON WHAT YOU THINK!!!!!!!!!!!!!!!!!!!!!!!!!!!!!!!!!!!!!!!!!!!!!!!!!!!!!!!!!!!!!!!!!! You can transfer Wii miis to your 3DS! Hopfully Nintendo will let you unlock your mii, but thats the only problem; We don't know if you can or can't unlock miis. You have a good roster, its just missing some more characters. It seems similar to the wii roster. other than that its pretty good. @blueboom I heard its coming out june 2nd... is it? @blueboom yea, i hope theres bikes because in mario kart wii, i use bikes all the time! I just dont like riding in a kart because in a bike, you can do wheelies. edit: if those are the actual characters, im gonna use my mii. I wonder if the mii characters start saying something else this time around instead of: "go go GO" and haHA because thats what my mii says lol. @blueboom Ya, didnt you here! Nintendo's only using one friend code per system. so once you put it in, it just uses that code for all the games! I also heard you could send messages to eachother via the upgraded pictochat. p.s- I cant wait to use that new application! Nintendo should drop the bikes. As much as i love the bikes, it drove me away from the karts and it really wasn't "Mario Kart" anymore. The bikes had huge advantages compared to karts like wheelies, cutting the corners easily, etc. 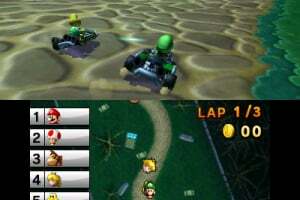 They should have those two person karts from Double Dash included with the normal karts. 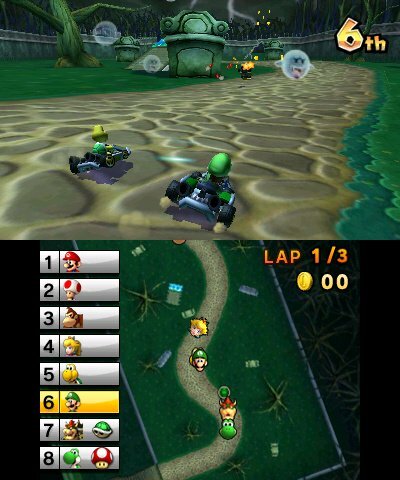 Maybe even a two person kart mode somewhere. uhhhhhhh aprox. 1 month untill the 3ds hits the u.s. uhhhhhhhh so excited!!!!!!!!!! 5 more weeks till the Nintendo 3DS comes out! I love the Bikes from MK Wii, I love the Blue Shells, I love the expansion to 32 tracks from MK DS onwards especially the use of retro tracks, however there obviously has to be something new for this MK. I'm hoping downloadable content eg new and old tracks or maybe some sort of Diddy Kong racing Adventure mode with a more or less open world to explore! (wuhu island with portals to the races?) Or a new game mode to replace or rival battle mode? 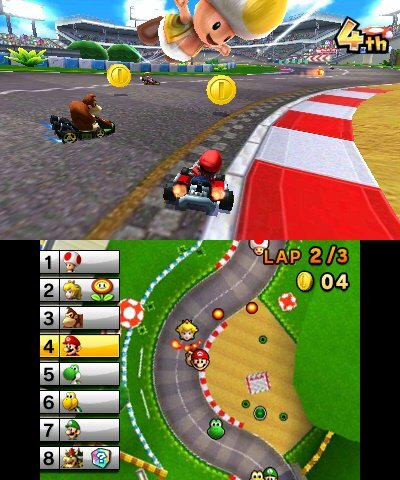 I'd personally prefer more tracks as although I loved Diddy Kong Racing, Mario Kart was the better racer in my opinion. These four weeks are going to last forever! Looks Pretty Good I Must Admit, Graphics Look Decent, Can't Wait To Buy This, And I Would Love To See A Return For 'GENO' On This Game! @blueboom Sorry ive been gone so long, but anyways, im excited too! I cant wait intill all the mario games they listed(Paper mario,Mario kart, and Super mario bros 3d) come out! I really want that new super mario bros game b/c just by looking at the logo u can tell that the tanooki suit is coming back! I wonder what it looks like in 3d! P.s- blueboom, ur not blue anymore! Hello true to all new character are: MARIO, LUIGI,WARIO,WALUIGI,BABY MARIO, BABY LUIGI, BABY WARIO, BABY WALUIGI, BABY PEACH, BABY DAISY, BABY ROSALINA, PEACH, DAISY , ROSALINA, TOAD, TOADETTE,KOOPA TROOPA, PARATROOPA,BOWSER, BOWSER Jr , SHY GUY, FLY GUY, KING BOO, PETEY PIRANHA, DONKEY KONG Jr, DONKEY KONG, DIDDY KONG, DIXIE KONG, TINY KONG, CHUNKY KONG, LANKY KONG, CANDY KONG, FUBKY KONG, KIDDY KONG, DRY BONES, DRY BOWSER, R.O.B, PAC-MAN, BLINKY, Ms.PAC-MAN, MAMETCHI, Jr. PAC-MAN, PRINCESS SHOKORA. i wonder if you can transfer your mii to mario kart 3ds. that would be cool, you could play as your mii, just like in mario kart wii. This game is going to be so awesome! I already pre-ordered my 3ds! One of the main reasons I am getting it is this game! !!!!!! THE 3DS IS FINALLY AT THE 'STATES. Getting mine this weekend! I'm still dying for this game though. Mario Kart ROCKS! Oh well, I'll just have to settle on SSFIV. I liked the bikes, but they don't seem to fit the title "Mario Kart". I will be fine with either bikes or no bikes. Bikes are pretty fun, but can get cheap when against karts, especially if the bike user is very good. The items are the ones that can change the game (though not really if only a 1 on 1). I kind of don't mind if bikes make it in this game, but it should be limited to some extent, such as a limited consecutive amount of wheeling or a cool time between wheelings. This is an instant buy for me, I adore the Mario Kart series. Hope Toadette and Koopa Troopa make it, as well as characters that were never in Mario kart. Tricks as well? They do help with races, somewhat. I just want this game to fix all (or most of) the problems I have with MarioKart Wii. 1. Make The Unlock Methods Reasonable: I don't want to have to perfect a racing game to unlock characters, because at that point it becomes a chore. And since MarioKart Wii felt like luck-over-skill, I still have about 5 characters still locked, and I don't think I'll ever unlock them. 2. Balance The Items: One good example is that bloody lightning cloud, why do racers in 4th and lower tend to get an item that practically hinders there chances of winning even more? I say make that item for 1st place. As for the blue shell, I could care less about it. 3. 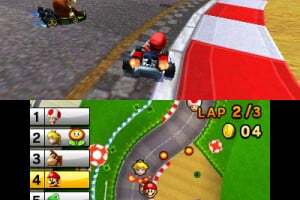 Remove/Limit The Bikes: Isn't this game called Mario KART, so why are there motorcycles? 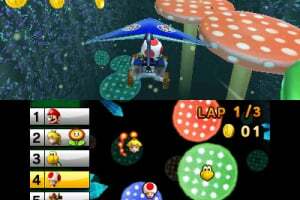 On a more serious note, while I did like the bikes in MarioKart Wii, they had too many advantages over karts (speed-boosting wheelies, cut corners easier, etc. 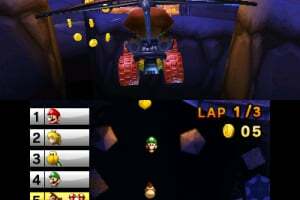 ), making the karts practically useless against them in races. A consecutive wheelie limit would be nice. 4. 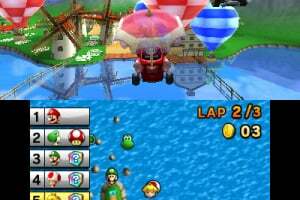 Fix The Battle Mode: One of my favorite things to do in the previous MarioKart games was play a game of Balloon Battle, a free-for-all match where the goal is to pop other's balloons with items and be the last-man-standing (There is also Coin/Shine Runners, but I never found it as fun). Words could not describe my sadness and anger when MarioKart Wii decided to change an already great formula for the worse. Teams? Time-Limits? Points? 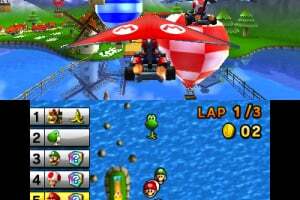 Forget all of that and give us the free-for-all survival Balloon Battle we all knew and love from the other games, and if they must have the teams, time-limits and points, make it a secondary option like "Team Balloon Battle" or something. Now I don't usually set some-what high expectations for a game, but MarioKart Wii really left a bad impression on me. 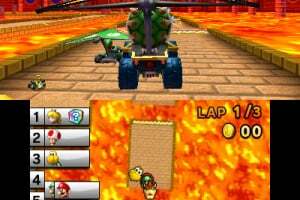 Aside from that I really look forward to the game, MarioKart has always been my favorite racing series, and for good reasons. Competition is fierce, yet there is always a chance for an underdog to win with a lucky item. And no friendship can end faster than by stealing a victory with the help of a Koopa shell. I don't care if there's no blue shells, I just want the game! I looked at Gamestop, and the releases for Paper Mario, this game, and Super Mario 3D are anticipated to be on August 2 this year (oh please God, not next year)! 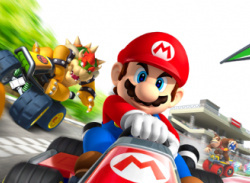 I love mario kart I would sell my home for a nintendo 3ds and mario kart. I love every mario game ever!!!! IM getting my 3DS today!!!!!!!!! YYYYAYYAYAYAYYAYYAYYYYYYYYYYYYAYYYYYy I can't wait till this comes out. I hope this game takes advantage of the 3DS's Gyroscope! Some screenshots show this game to be set on wuhu island! Is wuhu island the next mushroom knigdom? Please release this soon, Nintendo!!!!! does anyone know when this comes out to north america? Hopefully they'll have Shy Guy as a playable character. I know he was in MKDS, but only through DS Download Play and hacking. It'd be nice if I could play as him without the use of those. Or, at least some other enemy other than Koopa. Dr yBones is OK, but someone else would be nice, like Blooper, Shy Guy, Boo (or keep King Boo), idk I guess it's not necessary, but Shy Guy for the win! Man,I can't wait for Mario Kart. I just wish people would stop using the annoying Blue shells.Ugh. On pre-order since launch. 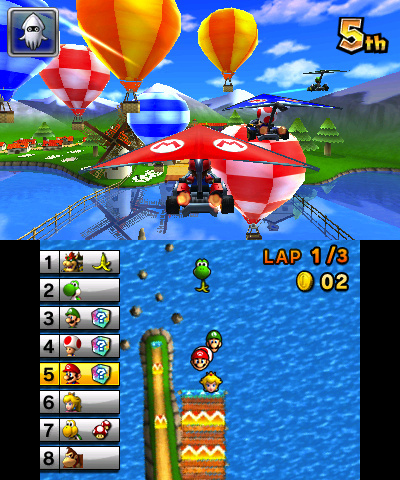 Mariokart is always a good time, and for once the mobile versions have trumped the console outings. DS version was spot on the feel of the snes versions tension, and excitment. I hope that makers of chocabo racing and facekarts are face-palming. finally something more popular than Ocarina of Time! I still don't see why that game is so great. It's just a remake. @blueboom the others you posted are real? Or just what you want to have? Where did you get your source? Cannot wait any longer for this. 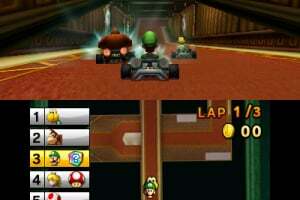 Mario Kart... 7... I sure hope Nintendo changes the name of this game before it comes out. Looks awesome, though. Me too, but Rosie was just a guest character, and her debut in the Galaxy series will probably be the first and the last. I hope they bring back the feather from Super Mario Kart. The feather is still my favriote power up and it would be cool if Rosalina was in the game. I want the SMK course where the Monty Moles attach themselves to you. @45 Yea, but if you are any good at mario kart you will get hit by it more often than getting the item to hit others with. @135 Agreed. It completely takes away the fun from the skilled people. So no bikes? I'm fine with that, bikes were way overpowered, with their sharp turns, and their wheelies, and their...ways. 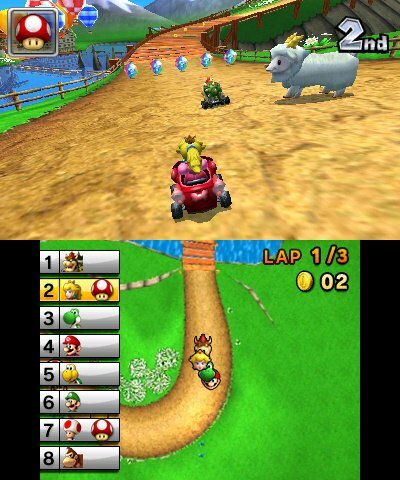 does anyone know if mario kart 7 can play 2 player with other ds's like the ds lite? i mean so you could have a 3ds with the game could it play 2 player with the ds lite? Why does every one hate the blue shell? It's so rare (in the versions I've played at least) and it adds a wonderfully fun random quality to the game. i know for a fact that it is impossible for a 3DS game to be played multiplayer w/ a DSlite system.this is true because the systems run on different engines. but a 3DS is backwards compatible, therefore it CAN play multiplayer w/ a DSlite, BUT it has to be a DS game. 3DS games are shaped differently to normal DS games anyway, so they dont fit in to begin with. once 3DS sales rise, I will get that and the 3DS. Mario Kart Wii is my favorite in the series. I'd like to play a demo of 7 before I decide I if want it. Sorry guys, looks like there will be blue shells after all. I hate them too, but look on the bright side! New characters, Kart customization, Gliding, Propelling underwater and more! This is going to be a great game. 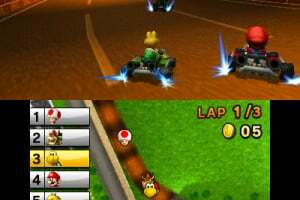 you can see the trailer for Mario Kart 7 and if you look at the items you can see that the Spiny Shell/Blue Shell has no wings! @WhiteMage75 I'm happy that she's back too! Happy for lakitu too, but Metal Mario seems a bit random. Will you be able to play as Lakitu with a green shell? 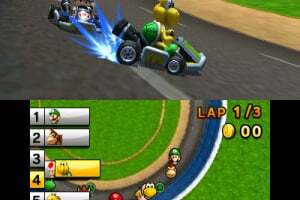 Isn't this the first Mario Kart to have a number in the title? Why now, after six freakin' games, do they decide to let us know how long they've been making this series? I cant wait for this game to come out! i hope they bring back baby Mario and baby Luigi because they were one of my favorite characters. i hope that they put a course that is inspired by super Mario sunshine because that was one of my favorite Mario games of all time. They added 3 new items and a classic! the Fire Flower, Tanooki Leaf, and the 7 in the title and took out the flying blue shell and added the original spiky blue ground shell!! i can't wait til it comes out! 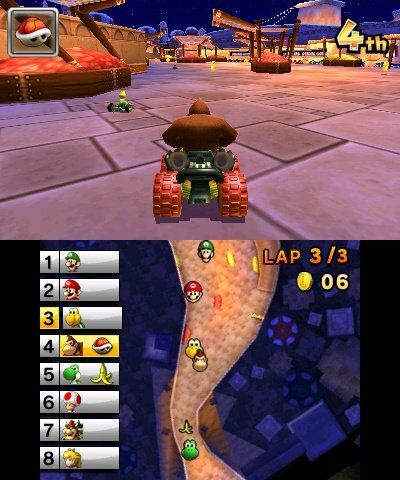 i herd there is all new karts,and tracks. its gona be sweet! @ Reghav: it is 40 dollars. I just paid it off at Gamestop. Yay. I want this. 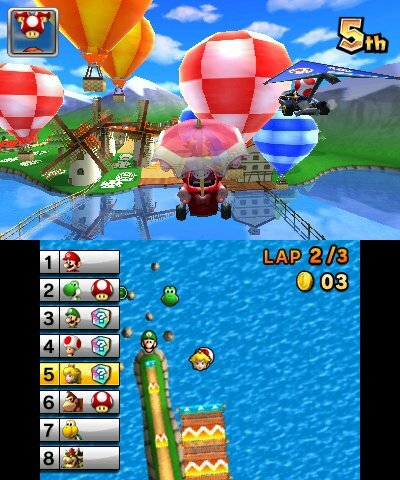 Wifi, streetpass, spotpass, gyro controls, customizable karts, MARIO! How much better can it get? 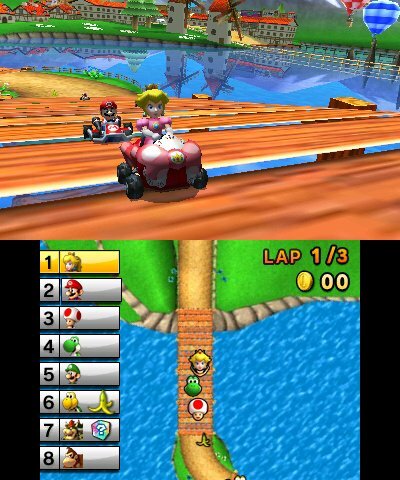 Also looks more toned down than MKWii too...hope there are not that many items boxes per lap and also 8 players will make for better racing. cant wait! i will have all the mrio karts when i get this one! i think this link is self explanitory. can anyone give me a hand and help me get the NL staff to see this? blueboom I added you too but it still doesnt say that we are friends..
Can Shadowluigi2 and Eaglelion add me and tell me your name pls, my code is in my sig in the forums. Now it says we are friends. You can't chat on the friend list cam you? Yes u can but u have to have internet.... when u wait a couple of min it tells u who's online or offline but really have to wait! !IT takes one min. @Raghav no.1...........I might be on lots of times ,so when u go on go on friends list first!! i mean what is your friend code @raghav ??? wait until it says you are online then wait like a minute longer. That same thing happened to me. Cant wait for this game, pirannah slider looks great, amd its obviously based off of Super mario bros.
nintendonerd147 is asking for WAAAAY too much, characters that wouldn't even work. Sorry to all the Waluigi fans out there; he's not playable in the game - at all! At least you have his awesome Pinball stage though. And I get to play as Rosalina on her brand new Ice World level! Cloud-San-VII can you add me too. my code is in my sig. Hey can someone add me? @xino-san-vii please look at @164... ^-^ that's where my FC is..
Ugghh! You Guys Need To Stop Complaining About The Blue Shells. Sure I Hate'em Aswell But If Nintendo Take Them Out, It Makes The Game More Boring. There Are Ways To Avoid Them And I Will Post It Later On And You Guys Have Much Better Stuff To Take The Lead Such As: Better Drifting, Skills In The Air To Get Boosts, And No Ghost Items So People Cant Take Your Items. All Im Sayin Now Is If U Wana Win, Use A Kart With Really Good Acceleration. Im Talking About Yoshi. He May Be Light But He Sure Is Fast! 1st of is blue shells. 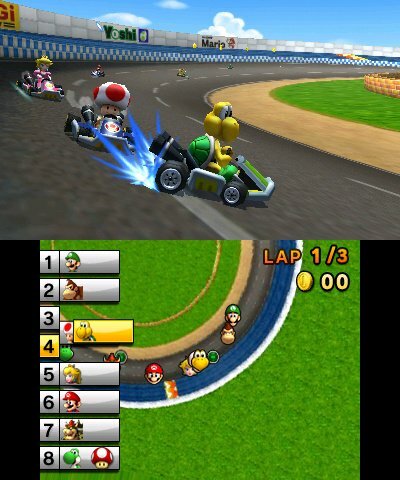 everyone should know the place dk pass in the leaf cup in mario kart 7 but in the start cup in mario kart DS. Im pretty sure that the majority of mario karters always go past this place. 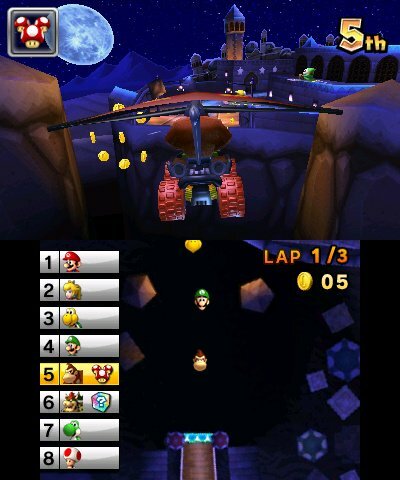 in dk pass there is a hidden item box located on a hill on the left just shortly after the second items boxes. now this certain item box contains only 3 items and it does not matter position you are in to get these items. it contains a single mushroom, three mushrooms, or s super star. now if you are first (like me always) if you can find the item box get it and hope for a star. now if you get it do not use it when you want or when a red shell comes. it just a waste. wait for a blue shell to come then activate it then you are invincible. another place where you can dodge the blue shell is waluigi pinball but this is with no items. you just need to be fast enough. 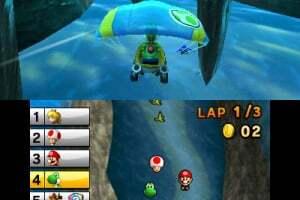 if someone has sent a blue shell to you make sure its when you are round the start of the lap near the hyperjump then if you are in the hyperjump while the blue shell come it will hit but it wont affect you. 3rd is tricks. try to get on anything that lifts you up into the air like ramps and stuff and just press the r button to a trick to do a trick in the air. it may be a little boost but it will make a big difference. This is James McCloud. I have it since its first North American day, December 4, 2011. I don't usually like racing games, but Mario Kart is amazing and this one is the best yet. But even so, as soon as they take out Blue Shells, it will instantly become many times better. It's literally just that simple and I don't get why Nintendo can't realize that. They can add an option for it, just as long as the default for everything is "no blue shells". There's only one thing I don't like about this game: Toadette isn't one of the characters! should i paay nintendogs or mario kart 7 ?? so uthere is my friend code add me and ill add you ok? hey my friend code is 0860 3781 4238so add me cool people !!!!!!!!!!!!!!!!!!!!!!!!!!!!!!!!!!!!!!!!!!!!!!! srry i will add u on monday,ShyGuy and do u hav swapnote? ?Also do u go online?? ill race u any time anywhere... if im online but my friend code is 5241 2419 7593. so request me and lose. also dont use broken karts that is super lame and cheap and i hope nintendo will ban them soon cuz its really no fun for anyone. whats your name? ?and do u hav swapnote? hi its me shy guy srry i lost my 3ds for a week so maybie friday i can go on but yes i have swapnote and yes i have internet on my 3ds so ttyl need to do homework !!!!!!!!!!!!!!!!!!!!!!!!!!!!!!!!!! hey i got my 3ds back !!!!!!!!!!!!!!!!!!!!!!!!!!!!!!!! How great but,i'm still curios where i left mine but, i will find it today and get your friend code on my friend list on monday. Restrictions:You must use a mii !!! If your looking at this comment right now well get this game the gliders are epic my favourite person is metal mario and theres online witch makes it so cool! hi i am back blue bloom plz delete me and i love my 3ds got a report to do byee!!!!!! First Started With Yoshi, The Played About With Koopa Troopa, Them Lastly Tested Lakitu. What Do They All Have In Common??? I JUST OT THE GAME! No story mode. I wish they made it like just "Crash Nitro Kart". dude add me again look back and find my friend code. it is 086037814238 dont stalk me and tell me if your going to add me ill add you too my name is cam i acully moved south soo yea !!! EVERYONE WHO IS READING THIS ADD ME AS A FRIEND I AM AWSOME AND I WANT ALOT OF FRIENDS U TELL ME YOUR FRIEND CODE AND HERES MINE 0860 3781 4238 !!!!!!!!!!!!!!!!!!!!!! I'm glad no one yet has done a hack to win a race. Here is my Formula One Cup community number:05-1024-3592-9787.Class:150cc.Items:Mushrooms.Drive in my community! 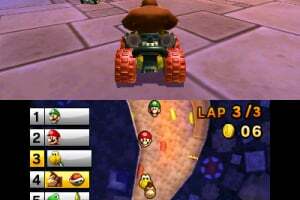 Remove stupid blue shells I hate them!!! @Angaran sorry dude, but it doesn't. 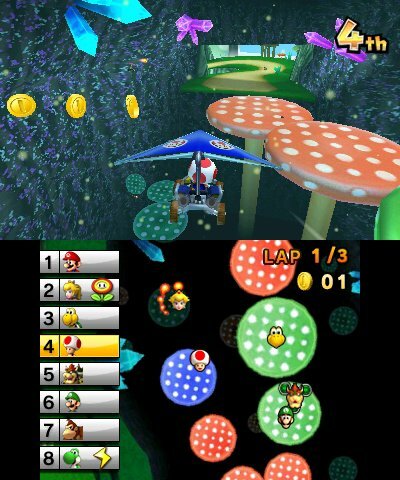 It does have tracks FROM the Wii, though... like Mushroom Gorge. A good game, but not as good as the DS one. great game, i've only had this for 5 months so im a little late to this game but i love it . ↑ This is rather odd. @nintendonerd147 (Also very late) You don't have to use bikes if you don't want to. I honestly thought they just added more variety to the game (along with stunts and wheelies, that added more need for skill in the game). It was your choice whether you chose the bikes or not in game, so it really has either a positive effect, or no effect on the game.